Here’s What NOT to Put in Your PTR Compactor. There’s so many benefits of a having a PTR compactor in your facility, like the space savings, cost savings, improved safety and productivity, and overall healthier work environment. 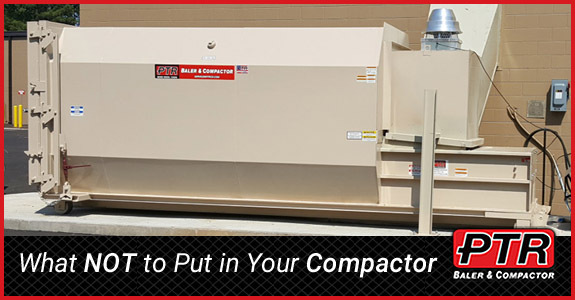 You’ll want your waste compactor to continue working at the optimal level for years to come. To help ensure this, educate your employees of what is safe to put in the compactor and what is not. Flammable Substances are not safe to place in your PTR compactor. Anything explosive or flammable should be kept far away from your compactor. A fire inside the equipment would be extremely dangerous for nearby employees. This includes aerosol spray cans, as they are under pressure and it’s possible they may explode in the compactor. Batteries should be disposed of according to recycling standards, and not thrown into your compactor. Batteries have a highly toxic substance in them which would contaminate the other contents of the compactor, making them no longer acceptable for recycling. Liquids are a no-go in your Stationary Compactor . PTR Self-Contained compactors are equipped to deal with wet-waste, but not Stationary compactors. Disposing of liquids in your stationary compactor can lead to unwanted odors. Organizations like supermarkets, malls, movie theatres, restaurants, hospitals, food processors and retail supercenters who process wet waste will require a Self-Contained compactor. PTR’s innovative Sure-Tite Liquid Retention System is key to preventing leakage. Be sure to discuss with type of compactor is best for your organization with your PTR Customer Service Representative. It’s wise to train your staff that if they aren’t sure, to air on the side of caution always. Lastly, make sure employees know to never place their hands, arms or other limbs in the compactor, as this is extremely dangerous. If something accidentally falls into the compactor, no one should ever reach in to retrieve it. An appropriate tool should be designated for this. Questions? Contact PTR Baler and Compactor today. PTR Baler & Compactor offers support for you technical team with training classes. 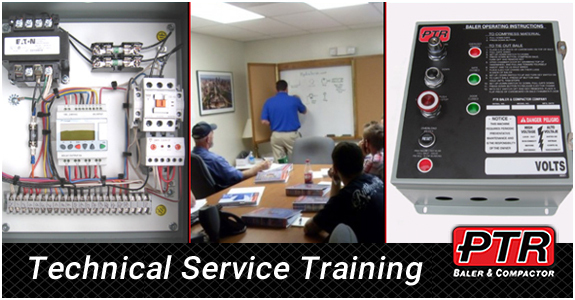 These highly specialized Technical Service Schools are scheduled several times during the year. The next classes are coming up in fall 2018, in September and November. Upon completion of the courses, professionals will receive both a ‘Certificate of Achievement’, and also be registered as a PTR Certified Technician. Four PTR Education credits will also be rewarded to participants. They will also gain access to PTR’s Technical Support Team. This is a huge benefit, as newly certified technicians will have their additional support and expertise in the field. Professionals will attend 2 days of training and be provided all necessary course materials. Continental breakfast and lunch are also provided. To reserve your spot now, download and complete Registration Form by clicking here. 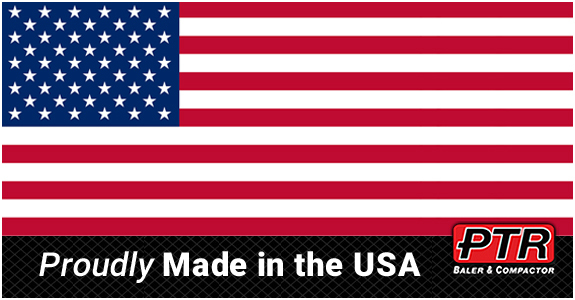 PTR Baler & Compactor Company is proud to manufacture all of our products in the U.S.A. Since the inception of our organization in 1907, we’ve offered the highest quality, safest, built-to-last product possible. We have never wavered in our pledge to keep it all made right here in America. PTR leads the industry in proving that you can produce a superior product while still being profitable and competitive on a global scale. It also allows us to be able to invest more in research and development, brining forth innovative technology that makes our products even better. This mission is deeply ingrained in every aspect of PTR Baler & Compactor Company, from products to employees, to our community endeavors and beyond. While others took the easier route by outsourcing, we continue to stand our ground and do what’s right. Since all manufacturing is done right here in the U.S., quality control is not a challenge like it is for other companies. We’re also proud to keep jobs here at home. This Fourth of July, we reflect on all it means to be an American. PTR Baler and Compactor Company is proud to produce an American-manufactured product. We promise to uphold our pledge to keep producing the safest, longest lasting, highest quality, American-made equipment in the industry. PTR Rebuilt units are a great, economical option for companies that may not be financially able to purchase brand new waste equipment. What is PTR Rebuilt? 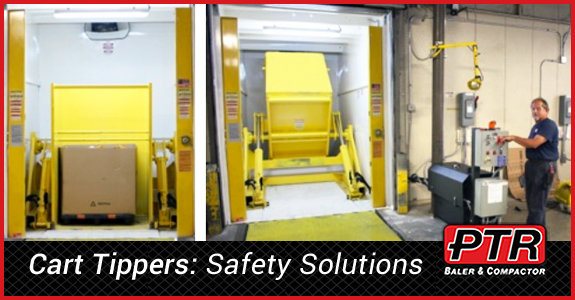 They are fully inspected, certified & reconditioned vertical balers, stationary compactors and self-contained compactors. There’s a lot that sets PTR a cut above the rest. We proudly train the best waste equipment experts and OEM factory trained technicians and meet and exceed OEM quality standards. Additionally, we include a 90 day limited warranty with your equipment purchase. Not just any unit will qualify for PTR Rebuilt. The baler or compactor must be less than fifteen years old. No structural defects may be present. The unit must then pass a rigorous 52 Point Inspection. OEM standards must be reached in order to be PTR Certified. The thorough reconditioning is performed by PTR’s AWS certified welders, so you can be sure the job is done right. At this point any electrical, mechanical or hydraulic problems discovered are corrected. Then the refurbishing process begins. PTR balers and compactors are equipment that helps your company meet sustainability goals. By recycling your waste handling equipment, you’ll become an even greener company. 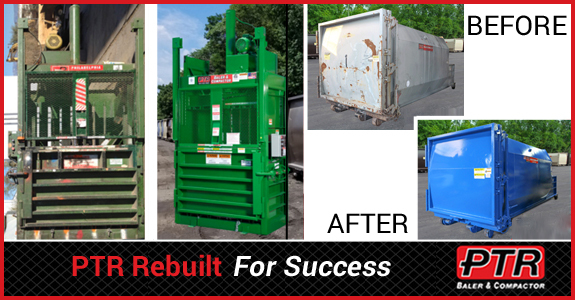 Your PTR Rebuilt baler or compactor will look and work like new. Learn more about PTR Certified Pre-Owned waste equipment today, or ask us about our Nationwide Rebuilding Programs. Click here to contact PTR. PTR’s key missions are to improve safety, productivity and sustainability in the workplace. From conception to creation, our balers and compactors are created with those ideals in mind and they’re made to last. If you’re looking to reduce the chance of employee injury even further, PTR Cart Dumpers may be the answer. Your waste handling employees spend a significant amount of time moving waste from collection bins to balers or compactors. This leaves them open to back strain and injury. Injuries cause hardship for the employee and organization alike. They are a drain on productivity and costs. You can help avoid them by utilizing commercial cart tippers. This specialized equipment is created to make moving waste from collection bins into waste removal containers faster, easier and safer. Because the time needed to transfer waste from the collection cart to your waste compactor or dumpster is significantly reduced, you’ll experience a significant cost-savings, as well. Additionally, cart tippers help keep floor space clear. PTR Cart tippers are simple to install. Plus, our technicians will happily show you and your staff how to properly use all PTR equipment. View our full line of cart tippers, also known as cart dumpers or commercial lifters, online by clicking here. Keep in mind, PTR Cart Tippers are customizable to your companies needs. Let us demonstrate a solution that fits your organizational needs. All markets would benefit from this equipment. Cart tippers help you save time and money, while reducing potential for work related back injuries. Ready to learn more? Our customer service representatives are available to answer any of your questions. Click here to contact us today. Focused on implementing a zero waste or corporate sustainability policy at your company? 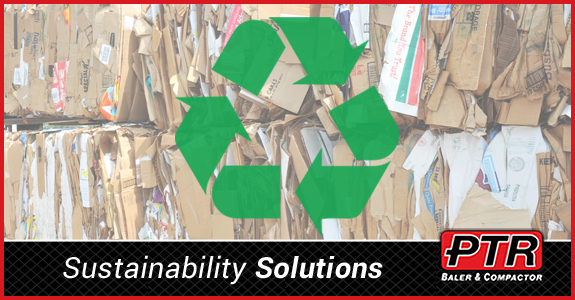 PTR’s balers, compactors, and additional waste equipment products help your organization meet and exceed it’s sustainability goals. We offer a versatile line of products than suit the needs of small or large companies and help you maximize recycling revenue. Our waste equipment allows you to divert cardboard, paper, plastics, shrink wrap and aluminum into recyclable commodities. Today more than ever, organizations must to be conscious of their landfill contributions and carbon footprint. Effective waste management is a critical step in implementing corporate sustainability practices. Less waste means fewer trucks hauling waste to landfills. Fewer trucks on the road then equates to less dangerous emissions polluting the air. It also results in serious savings for your business since you’ll be paying less transport fees, for example. PTR equipment is the most efficient, durable, and best quality that exists in the market today. Our balers and compactors minimize the overall amount of waste your company sends to landfill. The bales produced are also an extra revenue stream. Contact our experts to help you choose the model size or piece of equipment that is right for your organization. More importantly, however, your company, employees and the entire community will experience the benefits of reduced waste and a smaller carbon footprint. It’s an organization’s social responsibility to do all they can to contribute to a healthier world. Did you know that recycling 6 aluminum cans equates to 1 hour of running an air conditioner? To see more of what your recyclables mean for energy savings, click here. PTR Rebuilt equipment is another great option for many companies. We’re able to recondition our equipment to extend it’s life. In terms of sustainability, the more durable and long-lasting your waste equipment, the better. Now, with the addition of our 50th anniversary option- the Quiet Pump Power Unit – our balers are quieter than ever before. How does this relate to sustainability? Since there will be less back room noise, you can utilize space in the same facility for customer areas, therefore reducing your overall footprint. Our mission as a company is to help businesses reduce waste and create a healthier internal and external environment. Ready to learn more? Contact us today. Introducing our 50th anniversary option, the Quiet Pump Power Unit. 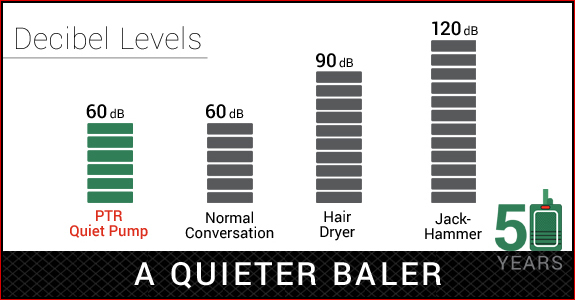 PTR Baler & Compactor Company continues to innovate and lead the industry with the new Quiet Pump Power Unit. The Quiet Pump can be retrofitted to existing units as a kit and can also be used on compactors. This innovation means major strides in safety, productivity and cost-savings. We’re exited to share some of the exponential benefits of this technology. Another huge benefit is that the Quiet Pump helps employees to be more alert of what’s happening in the warehouse. It allows them to hear other, more dangerous sounds. For example, say a fork lift is in use. Other loud equipment operating simultaneously may impair their ability to be alert to the forklift. As many companies begin to lessen their footprint and downsize their facilities, customer areas may be just outside the warehouse. Therefore, they’ll be exposed to back room noise. To keep things quieter out front, you’ll want to keep noise levels down in the back. The Quiet Pump will play a critical role in this. Our April newsletter focuses on the many features and benefits of the Quiet Pump Power Unit. Not signed to receive our e-newsletters yet? Click here to access the ‘Join My List’ Facebook tab and add your email. PTR Baler and Compactor Company offers a separate website to handle all of your parts needs. Parts.ptrco.com is an extensive website dedicated solely to parts. PTR Parts provides quality OEM parts to other service providers who maintain and repair their own equipment. PTR is the industry leader for quality products, parts and service. All parts are OEM Certified to insure that you receive the correct part for your PTR manufactured equipment. OEM baler and compactor repair parts are UL listed for use on PTR manufactured equipment. Using quality replacement parts like Square D, Cutler Hammer, Baldor and Idec helps to insure that your machine will experience uninterrupted service. What’s more, all baler and compactor parts are backed by our one year replacement warranty. The site is easy to navigate and user friendly. You can view by type – electrical, hydraulics, mechanical and decals. Or, you can browse by product: balers, compactors, cart tippers, docks and doors and bailing wire. There’s also a wide assortment of protective gear available on the site. Because we are a manufacturer, PTR maintains a large stock of parts in our distribution warehouse. We buy in bulk, giving us a considerable purchasing discount. We’re then able to pass this savings on to our customers. Shipping on all orders is fast, because we know you need the right part for the job as quickly as possible. Create an account so you can view current order statuses, build a wish list, and manage returns. To stay up to date on all parts offers and features, be sure to join our Parts Mailing List. Right now, our featured products include products like a hydraulic pump, hydraulic cylinder and a relief valve cartridge. Visit parts.ptrco.com to see all featured parts, as well as our entire selection. 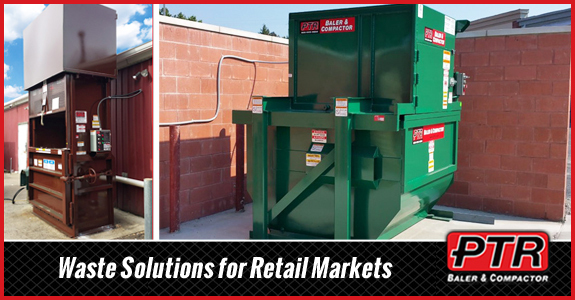 PTR Baler and Compactor Company is the industry leader in meeting the waste equipment needs of the retail market. Our retail waste solutions experts work with 16 out of the 20 top retail chains in the country. PTR has decades of experience working with various retail markets. Retail chains know how critical it is to keep floor space clear, for both safety reasons and efficiency. If sustainability is one of your main goals, PTR’s waste management equipment can help you achieve it. We will analyze the waste stream and provide a custom solution for your company. Our professional staff can assist you whether you are opening a new retail establishment, replacing your old waste baler or compactor, or looking for repair for your current recycling equipment. Ethically and economically, sustainability policies are critical for all retail businesses today. PTR products are the key to reaching your company’s recycling goals. What was once considered waste, is now a valuable commodity. Instead of further contributing to our country’s growing landfills, you’re diverting that ‘waste’ to a recycling facility. Everything from cardboard, plastic bags, shrink wrap, plastic bottles, aluminum cans and co-mingled recyclables (sandwich bales), are all perfect candidates for waste diversion. Our full line of vertical hydraulic balers come in a variety of sizes to suit your retail business’s individual needs. The benefits are three fold; you’ll meet your waste stream requirements, convert waste removal expense into a revenue stream, and benefit the environment. Retail establishments including home supply chains, clothing chains and large department stores typically deal with mostly dry waste. Stationary compactors are usually the best equipment to deal with dry waste streams. Check out of full collection of sizes and styles to find the stationary compactor that will work best for you. Why choose PTR balers & compactors? Your employee’s safety is one of our top priorities when developing our equipment. All of products meet OSHA and NOISH recommendations and are fully UL approved. We put every product through extensive testing, meticulously engineered and inspected, and they are build to last. Our Bioloc secure access option is the ideal solution for retail chains who must meet OSHA and NOISH standards, as well as helping to reduce shrinkage and preventing employees under 18 from accessing the baler or compactor. 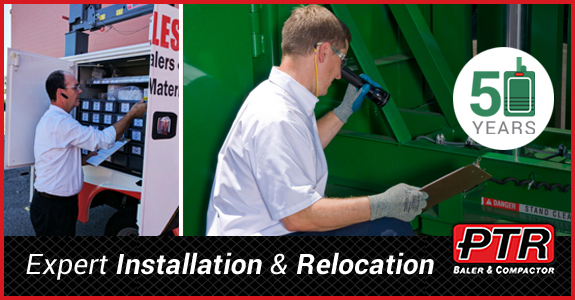 PTR delivers, installs and services your waste equipment to locations across the country, from coast to coast. Our technicians are highly skilled and thoroughly trained professionals. Our product is the highest quality available in the market and backed with a comprehensive warranty. The difference between a PTR baler or compactor and a cheap imitation is a safer, longer lasting, more efficient waste management system for your business. Choose PTR and you’ll be reaping the benefits of that choice for years to come. Click here to contact us today.